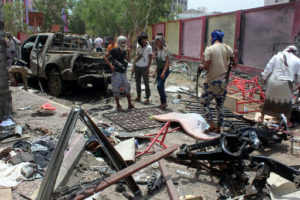 Islamic State of Iraq and Levant (ISIL) claimed responsibility for a suicide bombing attack in Yemen on Aug. 29 that left more than 60 people dead. Dozens more were wounded after a terrorist drove a car packed with explosives into an army facility in the southern coast city of Aden. The attack targeted a gathering of new recruits for Yemen’s security forces. Aden has served as Yemen’s capital and main base of operations during the ongoing battle with Iran-backed Houthi rebels. The Houthis control the capital Sanaa.